Boston Terriers - Companions to the Stars! If you own a Boston, you know you are the Star of that dog's life. You are A list all the way Baby. Bostons are made to adore someone. They are family, only better. Couple their sunny dispositions with unflagging enthusiasm, their joie de vivre, and you have something mighty special. They are bold, curious, bright and deeply affectionate. If you are introducing a Boston into your life, you are in for a real treat. Bostons simply excel at being there for you. 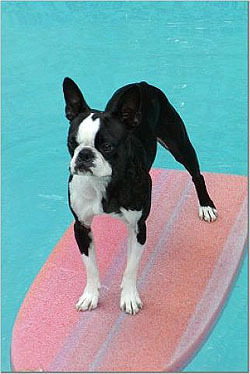 A Boston Terrier can be a young child's rough and tumble best buddy, running on the beach or tackling a basketball. Then again, a Boston can be a senior citizen's soulmate and confidante. They are more than happy to snooze on a comfy lap for hours at a time. They are wonderful listeners and rarely criticize your line of reasoning. Your relationship with a Boston is not a typical dog-human relationship: Bostons do not hang on your every word or constantly dream up ways to please you. Such overt grovelling is repugnant to them. No, Bostons are far more like surrogate children, in every wonderful and annoying sense. They will love you and test you all at the same time. Bostons have a delicious sense of adventure. Don't let the compact size fool you, believe me these are BIG DOGS. They love to hit the open road (and are amazingly easy to smuggle into posh hotels). They love to fly (first class preferred) and they are always ready to party, to mingle, with an adoring public. Roughing it is not entirely out of question either. Hiking, camping, fishing, these are all acceptable pursuits as long as their comfort has been seen to, e.g. a nice sweater or leather bomber jacket, a soft bed and decent vittles. We have absolutely fallen in love with this breed, and we suspect you will too. Our puppies become integral parts of their new homes. They receive, and rightly so, their own Easter baskets, wrapped Christmas gifts and web pages. Quickly their new owners cannot imagine living without them. They are often called the best dogs their owners have ever had. That is what it is all about. Don't believe us: Read the letters on the Gallery Pages (link below). Each year, we offer a few puppies for sale, ranging from sweet, non-papered pets to AKC registered pups from champion lines. If you own a lovelorn lady Boston, we can offer a date with one of our suave, smiling stud dogs. We also rescue Boston Terriers that have somehow fallen on hard times, get them patched up and on the right track again. How do you get one of our puppies?